Zeke Pipher (M.Div. ’01) isn’t your typical pastor. With an M.Div. from Talbot School of Theology and a D.Min. from Gordon-Conwell, Pipher is the highly educated lead pastor of Heartland Evangelical Free Church in Central City, Neb. 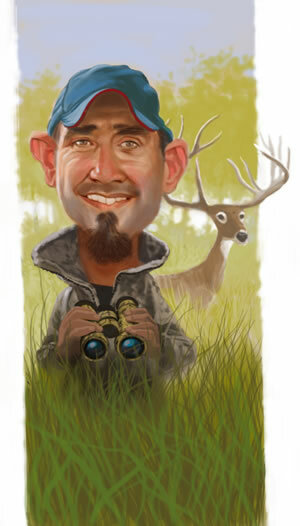 But he’s also an avid outdoorsman, photographer, event speaker and writer, published in several national magazines and recently awarded a book contract. Pipher has a lot to say about how outdoor sports intersect with his Christian faith, and he recently shared some of his story with Biola Magazine. I had the best possible seminary experience imaginable. I loved my professors and “study buddies.” My wife worked on campus, which helped us share the Talbot experience. And we were a part of a close, highly committed small group that met together to read the Scriptures, make meals, and play games (Usually Settlers of Catan). This group helped form a vision in us for what the body of Christ can look like. Immediately after graduation, I took a position as the college pastor for the EFCA church in Ames, Iowa. Ames was a special place for us. I learned how to be a pastor, we purchased our first home, and had our three children there. About three years into my ministry in Ames, I started to get an itch to preach on Sunday mornings. My senior pastor gave me a half-a-dozen chances to preach on Sunday mornings each year. He and I both recognized my passion for preaching, and he helped me strike out on the journey of finding a pulpit. Shortly after I began looking at positions, the EFCA church in Central City, Neb., called and asked me to submit an application. The more we got to know this church, the more we sensed God leading us to accept the position. I’ve always loved the outdoors. I started fishing when I was 4 years old. I started hunting pheasant, quail and waterfowl when I was in junior high. I began archery hunting large game animals when I was in college. I learned to fish from my mom, but I learned to hunt from a friend and his dad. I enjoy hunting and fishing because these sports give me an opportunity to get outside, by myself or with friends, and experience adventure and challenge. I also feel tremendous satisfaction when I acquire my own food through hunting and fishing. I love to cook, and one of my great enjoyments in life is preparing game in such a way that my family and others love to eat it. The first article I ever wrote was entitled “Bowhunting Apologetics.” I wrote it to provide reasons as to how someone who loves theology and philosophy, and loves to cook and travel and read, can also love to hunt. So, I guess I am somewhat of an apologist for outdoor sports. There are several reasons why hunting and fishing can be viewed as positive, productive activities. These sports provide great opportunities to spend time alone, or with friends. Hunting is the most strategic way of managing game populations and, especially in the Midwest, helping reduce the number of vehicle-deer collisions. These sports also help people appreciate the high cost of life that is required to sustain our lives as people. It’s easy to purchase a package of ground beef or lamb at the store, neatly packaged and wrapped in cellophane, and not slow down to consider the process of taking a life that makes that product possible. Many of the sportsmen and women I know have a solemn appreciation for where food comes from. One of the best arguments for hunting and fishing is that these pursuits give people a chance to unplug from the stress and pressure. Life moves at an exhaustingly fast pace. Climbing into a tree along a river for four hours provides a perfect setting for reading the Bible, praying, or sorting through the thoughts racing through your mind. Spending an afternoon on the deck of a boat helps you trade in a cell phone, computer, and khakis for the sights and smells of nature. These sports help you unwind, breathe unconditioned air, and recharge your batteries. These are good things. Most of my articles deal with the philosophical and ethical issues of a sport that involves killing things. Hunters and outdoor writers often try to find ways to soften this reality — you’ll often hear hunters refer to shooting a deer or elk as “harvesting” an animal — but the reality is that hunting involves taking a life. God gives us permission to eat meat in Genesis 9:3, but I’m fairly certain that he wants us to respect the cost that eating meat requires from animals. Not all hunters represent the sport well. I cringe when I see people in hunting videos or on television celebrate killing animals in disrespectful ways. I tend to write articles to try and encourage a more sober, thankful attitude. I’ve been married to Jamie for 13 years. She’s my closest friend, and a perfect companion for me in life. In addition to being a pastor’s wife, Jamie homeschools our three children. Kate, 9, Aidan, 7, and Claire, 5, are very different from each other personality-wise, but I’m so thankful for these differences. God’s been good to us through our children. I’m in the process of writing a book about men’s tendency to throw themselves into their pursuits with passion. This zeal is a good thing, but it can cause pain if men choose the wrong pursuits or chase after a good pursuit with too much intensity. This book will examine why (motives and drives) men chase things with such enthusiasm, and discuss ideas for how to choose the best things in life and live them out well. The gospel is at the center of this book as the one pursuit that it’s impossible to go too far with. My main goal for the future is to be faithful to Jesus as a husband, father, pastor, friend, writer and outdoor enthusiast. I’m constantly evaluating what faithfulness looks like, but my highest priority is to live my life today in a way that I won’t regret down the road. Ich hoffe mir kann hier jemand weiterhelfen! Ich bin total am Arsch mit meinem Latein. Mein Freund 20 Jahre geht fast täglich in die Spielhalle bei . Wir haben uns schon sehr oft darüber gestritten und haben ständig Stress miteinander deswegen. Sowie gestern wieder, er zu mir ich geh mal eben eine Stunde zocken. Dann waren es 7 Stunden. Er sagt zu mir er ist nicht süchtig und er geht nur dahin für Spass und sich zu entspannen durch ! Ich weiß leider nicht wieviel er dort lässt. Aber das ist doch zu oft, oder nicht??? Vor zwei Wochen hatten wir uns super gestritten, und er entschuldigte sich nachher und fragte mich wie er es wieder gut machen kann ich sagte, bleibe 2 Wochen von den Spielautomaten weg . Nach einer Woche war er wieder da. Erst sagt er zu mir, du bist mir so wichtig, ich will dich nicht verlieren wegen den Automaten Zockereien und am Tag drauf sagt er zu mir ich darf ja gar nix oder er sagt zu mir ich mache was cih will . Er sagt ich spinne und ich würde übertreiben . Wir reden immer und immer wieder über das gleiche thema. Und es ändert sich einfach nicht. Ich weiß echt nicht was ich tunsoll, er entschuldigt sich immer wieder und am nächsten Tag sitzt er wieder da. Unsere Beziehung geht langsam echt zu Grunde. Meine Frage, was kann ich tun? Sind meine Sorgen berechtigt oder sehe ich alles zu eng und übertreibe? Soll ich ihn einfach mal lassen machen oder die Beziehung beenden?? ?